By now you should know that I love sharing. For this Good Thing I want to introduce you to one of my favorites. My dear and long-time friend, Cyndi, is a talented pastry chef who creates exquisite pastry & confections that are not only beautiful, but truly delicious. Having trained at the California School of Culinary Arts, chef Cyndi bakes, cooks, caters & hosts television segments for morning television in Los Angeles. What I love about her cakes, cookies and pastries is that she pays attention to the details. Not only does she use the very best ingredients, she also provides great imagination & artistry in her work. 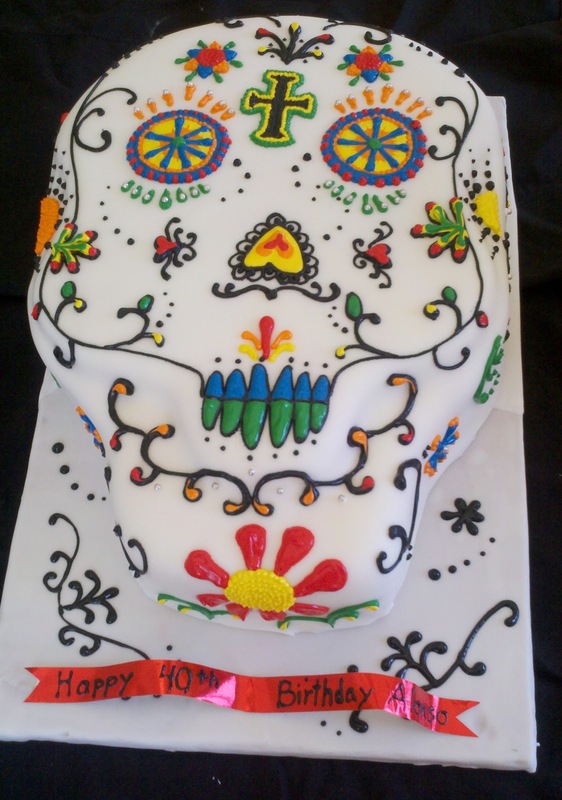 One of my all time favorite cakes from the many she's created & shared with me, is a wedding cake she made for a couple on the Mexican holiday, el dia de los muertos (the day of the dead). I think you'll agree with me that it's quite special and unique. Here's a small sampling of Chef Cyndi's work for you to enjoy. 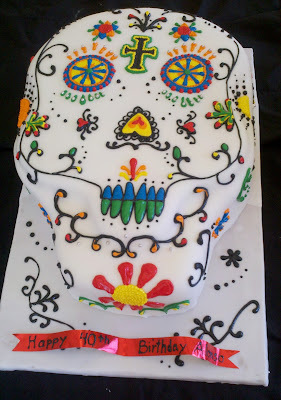 This lovely cake was made for a Dia de Los Muertos birthday party. The combination of royal icing, fondant and many bright colors make this cake unlike any other. 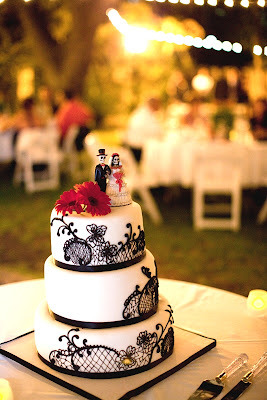 My favorite, a Dia de Los Muertos bridal shower cake. 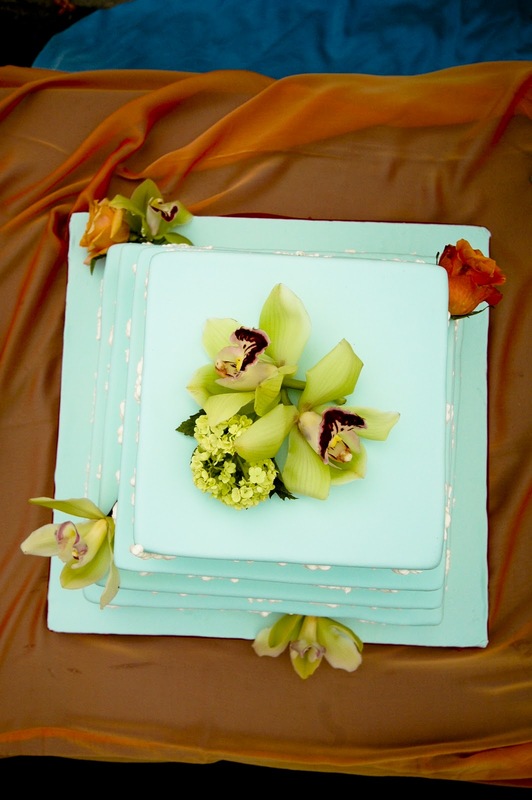 This cake is cloaked in a beautiful shade of orange fondant and is given minimal flourishes. The matching marigolds, called cempazuchitl or zempasuciti, are skillfully placed here and there. The expressive and colorful sugar skulls, typical decor for Day of the Dead (celebrated November 2 in Mexico) crown the cake. Simply beautiful! This cake was truly special. Chef Cyndi made it to celebrate her brother's wedding just last year. A delicious 3 tiered cake decorated in a black & white theme, with two red flowers & a skeleton bride and groom cake topper (those were used in the wedding invitations), made it a memorable centerpiece. A delicious work of art! 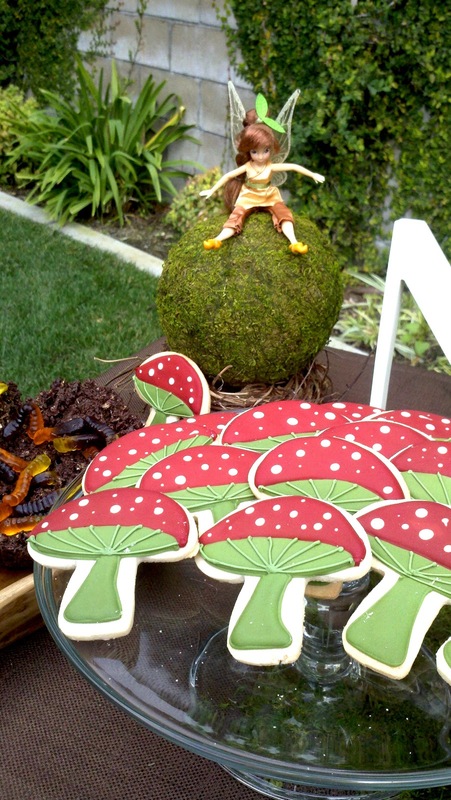 For a baby's first birthday, Chef Cyndi created woodland themed confections. This beautiful cupcake for the birthday girl was topped with an adorable chocolate doe. How cute & special is this? Whimsical sugar cookies hand decorated with such sweet mushrooms, sit on a cake stand for party guests. I've never seen such lovely mushrooms in my life. Wouldn't your sweet sixteen appreciate a cake like this one? Angled layers almost make this cake seem Tim Burtonesque in style (very unique!). It was a definite hit with all the party guests. 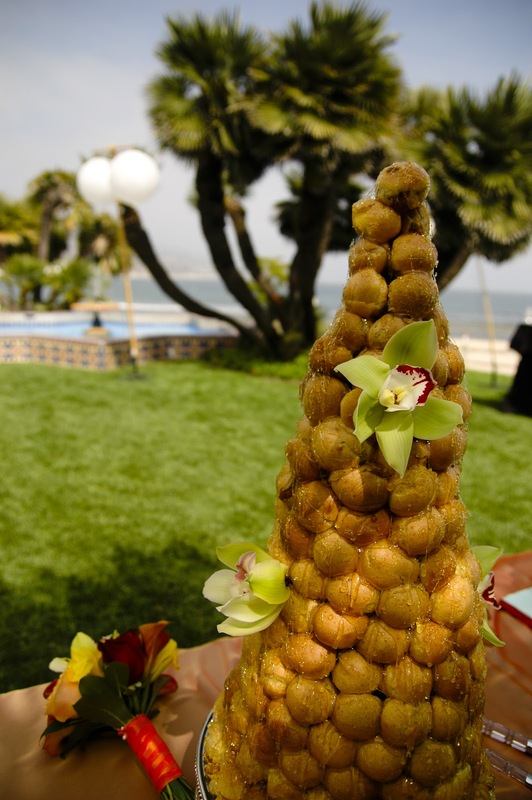 A seaside wedding in Malibu, California deserves nothing less than perfection. This chocolate marble cake is given a raspberry filling and a coating of buttercream. 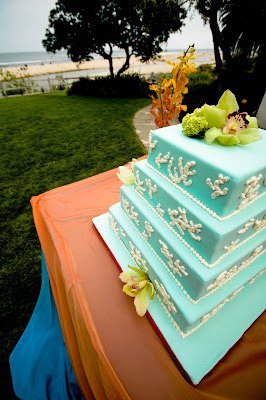 It is then cloaked in fondant tinted a beautiful shade of robin's egg blue and is given hand molded coral. A top view. Beautiful, don't you think? A croquembouche drizzled with caramel was provided for guests to pull apart. The puffs themselves were filled chocolate, vanilla & coffee pastry cream. Delicious! If you happen to live in Southern California and wish to make your next celebration truly special, contact Chef Cyndi. You can see more of her work on Facebook, by clicking here and liking her company page. You can also email her for more information at: nala623@hotmail.com. I love knowing talented people who create beauty and are willing to share; my friend Cyndi is such a person. 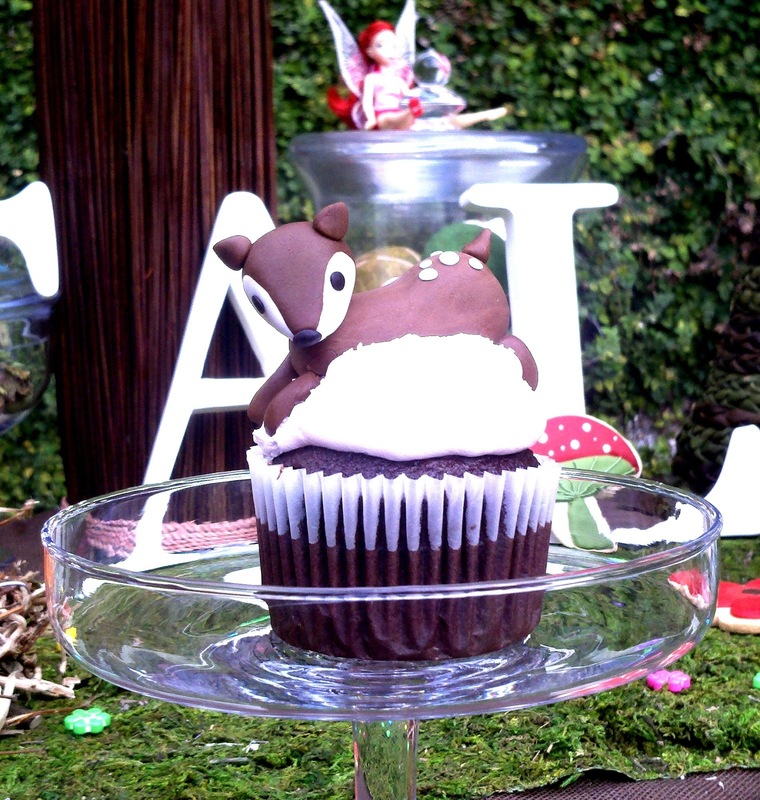 It's no wonder why I consider this talented pastry chef's work and creations, not only among my favorites, but also among the best Good Things. Thank you Cyndi!